Well he did it! 12 days averaging 80 miles most days in awful weather much of the time, Land’s End to John O’Groats. Approx 910 the route he took. I feel in awe and so proud. I was of course logistics back up in my little Skoda but what I had planned to be a leisurely role was anything but relaxed or stress free. I was constantly aware of the huge effort Peter was making day after day, drawing into the depths of himself but had not considered what it would be like to wave him off each morning and wonder if I would see him again. I am not exaggerating, he looked small and vulnerable alongside some of the huge vehicles thundering past him. I hope you won’t mind but so much has happened I will write about the trip in instalments. No worry then of missing any crucial bits out. We set off on Saturday 8th September for what seemed then like a long drive to Cornwall, paled into insignificance when I set off for Scotland in 30 mile stints. We stayed in a hotel at Lands End but it was such a rip off, I was embarrassed as so many tourists make a bee line for the place. Despite the surroundings the views of the headland are breathtaking and the hotel staff so friendly and kind. We had a photo taken at the temporary sign as the main sign which is up in the day is “owned” by a photographer who charges a lot of money to take photo. Business is business I know but this is taking advantage. Enough moaning as it did not detract from our efforts. 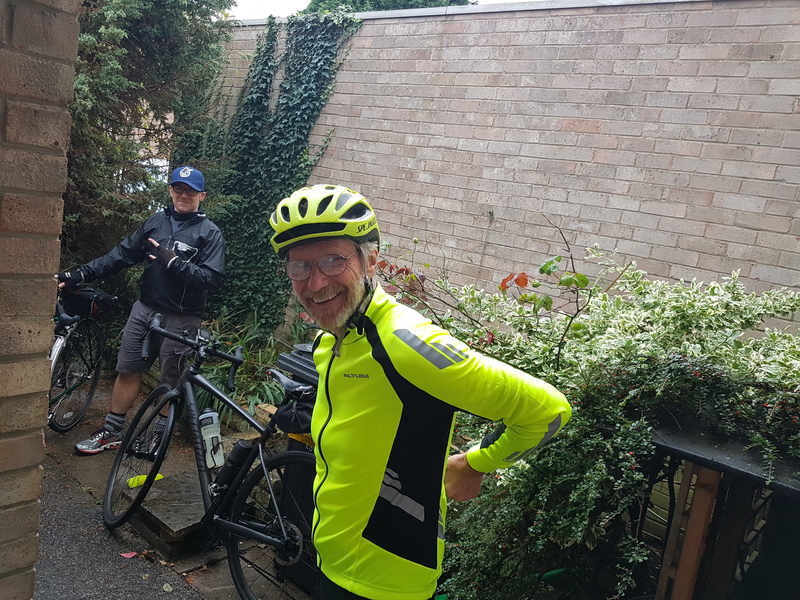 At 9am Sunday 9th September after a hearty breakfast Peter set off on his marathon ride. I felt very emotional waving him off, apprehensive and proud all at the same time. I admit to a few tears so walked part of the headland before setting off myself. We met up after 40 miles or so at Truro for a lunch break and for Peter to stretch his muscles. I found supermarkets helpful to get supplies and hot drinks. Another lone rider left just after Peter, I passed both of them at different stages, and we met him again lunch time. He was cycling a much shorter distance but appreciated having someone to chat to during a break. We coincidently met up the next day too at Okehampton. En route to Taunton. Sunday we stayed at our first Premier Inn at Liskeard, the routine was repeated 7 other times during the long journey and Premier Inns were an ideal break. Even had bike sleeping with us!! Monday 10th September we rode (not together!) over parts of Dartmoor to Taunton. The scenery was stunning but once in Devon the hills were testing for Peter. Tuesday 11th we stopped in Bristol at our eldest son’s house for a family reunion as our younger son left yesterday for a new life in Turin with his Italian wife so more emotions again. Adam, the eldest, then cycled with Peter to Monmouth over the Seven Bridge which was great for Peter. 3 counties in 3 days and ending up in my homeland Wales. Next day Wednesday 12th September onwards to Shrewsbury via Ludlow which was when I started to compile a list of places to revisit. Each day my schedule was tight but a routine soon developed. No time for sightseeing! We stayed north of Shrewsbury in our third Premier Inn where there was an interesting welcoming committee. 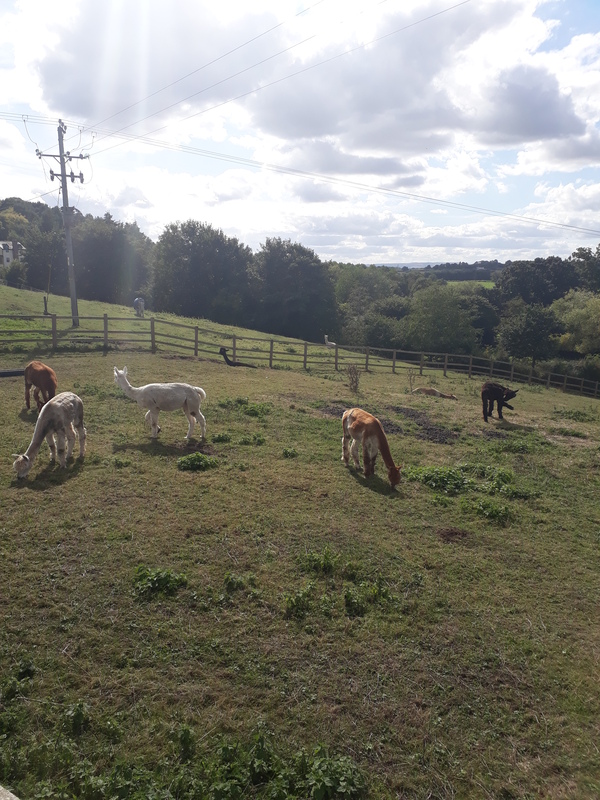 Yes alpacas in the middle of Shropshire! I’ll finish here for now but more next time. Thank you for your support and encouragement in this venture. It has been a life enhancing experience in many ways. I wonder if we all have dreams but some of us never realise them for one reason or another, a bit like bucket lists. 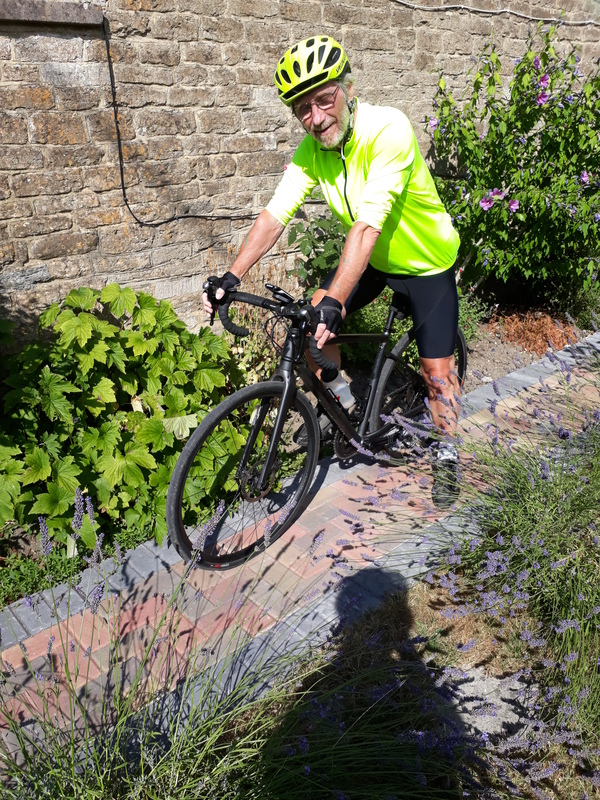 My husband Peter’s dream is to complete the challenge of cycling the whole length of England and Scotland alone, a challenge known by several names but he calls it LeJog. 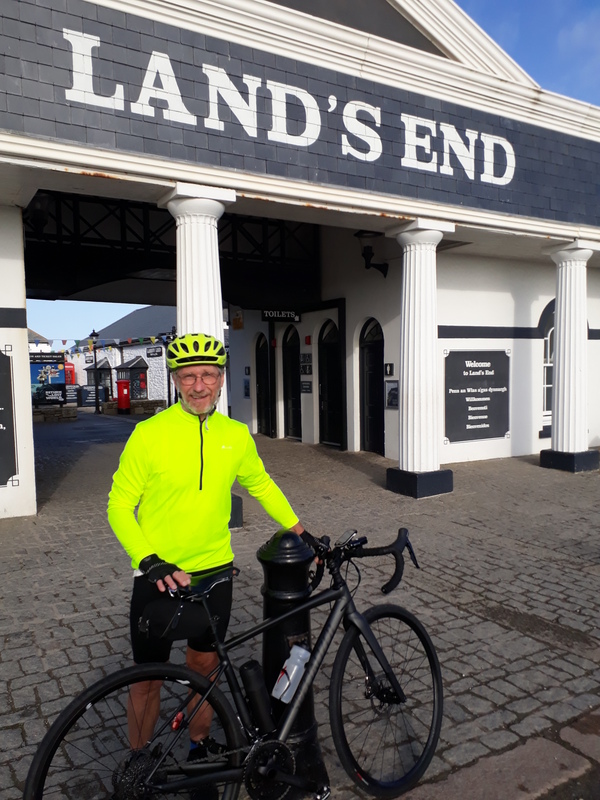 Land’s End to John O’Groats, an approx 950 mile journey. There are several routes but Peter is in the process of finalising his preferred route, it all comes down to stamina and strength of will to achieve this dream. I will be logistics support in my small Skoda car! An important responsible role but at least I am not on a bike!! I find the idea exciting but challenging and think lots of humour, as well as providing refreshments and a comfortable night’s sleep, to be part of my role. The whole thing depends on an all clear for me in August from the Breast Clinic at my two-yearly check up. Peter also must be sure his health is up to the task too. On 4th September Peter will celebrate his 70th Birthday so this trip will be his personal fulfilment of a dream. Many people undertake the journey but often in groups with lots of support. My husband has always been a loner so why change the habit of many years. 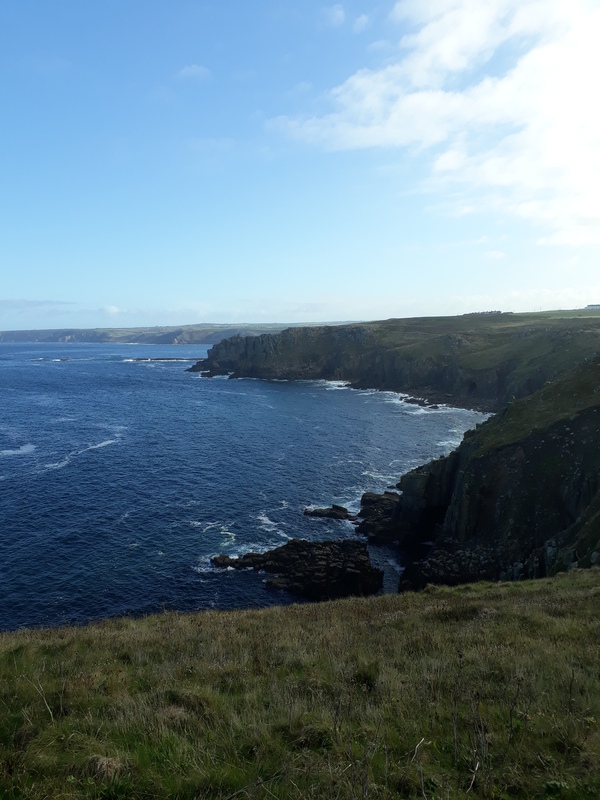 Our recent trip to Cornwall was part of our research into the enterprise. 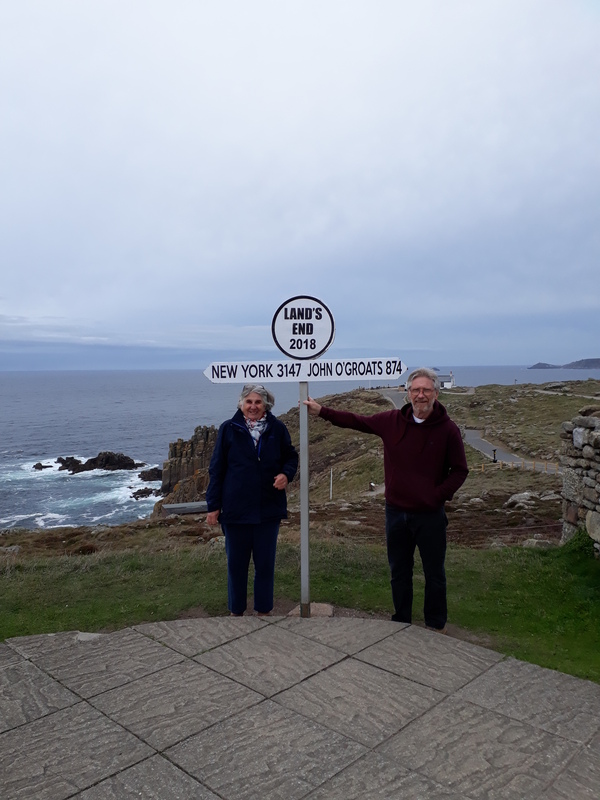 We checked out Land’s End (the start) but from a distance as it was £6 to go into the area around the famous signpost – more of that if we manage the trip. Land’s End seems to be a theme park now but remains the iconic starting point for many such challenges. My role is to book suitable overnight stays, meet up regularly to refresh Peter and be a general factotum. I hope to use the time in between meetings to explore some of the areas we pass through. I am not familiar with Scotland so am looking forward to new places, albeit fleeting visits. I hope to update you all with our plans plus possibly raise money for a charity. What I don’t want to do is put extra pressure on Peter. I anticipate other challenges to be the weather, possible injuries and bike repairs so my little car will be a hub for all eventualities. Communications may be a trial at times but we will overcome as the song says. Now Peter does daily training rides when he finishes work, usually 25 miles plus 80 mile rides most Saturdays and Sundays. Occasionally I persuade him to take a day off to recharge his batteries! We have a family nickname OMIL for him (Old Man in Lycra!) based on a term MAMILS (Middle Aged Men in Lycra). His outfits are quite distinctive but a necessary extra safety measure. I realise I’ve not shared my dream, at the moment I just want him to succeed. If any of you wish to share your dreams please do so. I anticipate a couple of interesting months ahead! Watch this space!! This appears to be the year I chose to meet some of my fears head-on. I joined a boot camp for weight loss, traveled to New York by myself, and I’ve committed to a gondola ride (ugh! heights!). Tomorrow, I get to see how I do with achluophobia (fear of darkness) and claustrophobia. The Cascade mountain range cuts a north-south swath through the middle of Washington State. The John Wayne Pioneer Trail bisects that mountain range, running east to west, following what used to be a railroad grade. Trains ran along this stretch from 1909 to 1980, after which it became a hiking, cycling, and horseback riding trail. The trail is 116 miles of path used widely by cyclists. The only other option is the main highway over Snoqualmie Pass. In 2009, the trail was cut in half when a tunnel through the moutain was deemed unsafe. It took two years and about $700,000, but they refurbished the tunnel. It opened again this past month, connecting western and eastern Washington State for those who prefer non-motorized methods of travel. The tunnel is 2.1 miles long with no lights (except the proverbial light at the end of it). Now, I sleep without the lights on at night. But going through a damp, dark, drippy tunnel like this sounds pretty spooky to me. So I’ve gathered the troops to make the trek with me. With kids and grandkids, we’ll total 6-7 people. We were originally going to hike it, but now we’ve commandeered enough bikes to cycle it. It’ll be about 6 miles round trip. We’re packing a picnic lunch to enjoy somewhere along the way (hopefully not in the middle of the tunnel). Tonight I’ll be testing and re-testing our headlamps. And packing some extra batteries, just in case. Wish me luck! I’ll try to add some pictures after we get back.